The United Nations has criticized Spain over a recent incident which saw a Cameroonian man dumped back inside Morocco after video footage showed him being assaulted by Spanish border police. The UN High Commission for Refugees is concerned that the human rights of those struggling to enter Spain by crossing high fences around the country’s North African enclaves of Melilla and Ceuta are not being respected. 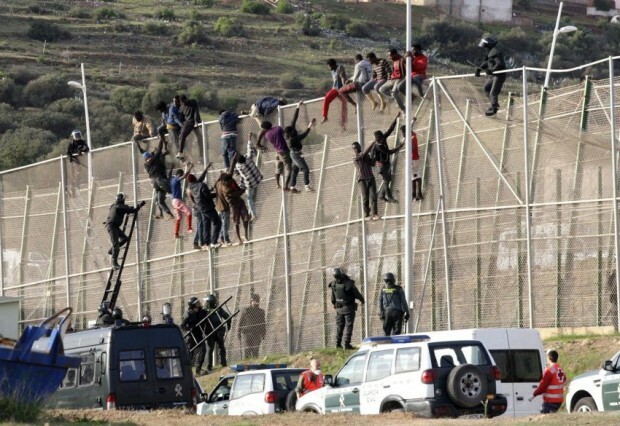 The spokeswoman in Spain for the UN High Commission for Refugees said she was “worried” by video footage of an attempt by a number of sub-Saharan Africans to scale the fence complex and enter Melilla from Morocco on October 15th which shows one migrant being beaten by border guards before being carried, apparently unconscious, back to the Moroccan side. “Whatever their reasons for trying to enter, these people must be respected and these images show that some parties are not acting as they should… There are people beating those who are on the fence,” Maria Jesus Vega told the AFP news agency. The UN is a scam to import as many third-worlders to the West as possible.